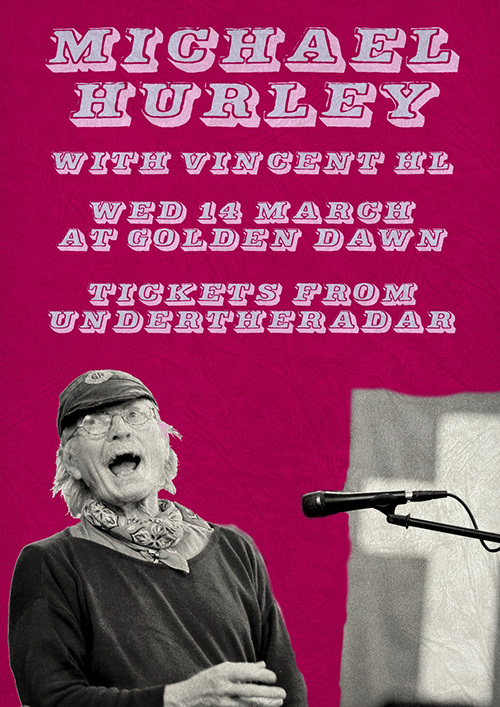 A true original American folk icon, Michael Hurley is returning to The Golden Dawn for one more very special show. Following his sold out New Zealand shows with Kurt Vile and Tiny Ruins here in early 2016, the 76 year-old troubadour couldn't keep away, and is swooping by to break some hearts once again. Hurley's career has spanned from Greenwich Village in the early 60s through making his base in the rural mountain communities of Oregon, counting Cat Power, Bonnie "Prince" Billy, and Bill Callahan among his fans. Joining Michael Hurley for this sweet sweet show is local lout Vincent HL (Whipping Cats, Magic Factory), showing off his slack-jawed, rumblin' ramblin' new tunes. Tickets are $25 from www.undertheradar.co.nz and strictly limited!